We’re back for another episode of the untitled LTT/LTR Podcast with us and The Font and White Yorkie where we discuss what’s hot and what’s not in the Twilight fandom, answer your reader questions, call each other by our real names repeatedly and get in on air fights! What’s not to love? As you can tell we’re still working on the iTune podcast store but if you happen to be handy with creating an RSS/XML file, by all means email us! Without further adieu… Let’s get on with the show! Kellan loves listening to the podcast while he travels! Editor switch – will we ever get to see David Slade’s original cut? Naming children after fictional characters? What are the redeeming qualities in SMeyer’s vampires? How do they explain their involvement in Twilight/LTT/LTR to girls? Do you take any tips from Edward or Jacob into your real life? WTF is a vampire senate? Can’t get enough? Want to know more? EPISODE THREE AFTER THE CUT! Imagine my surprise when I walked into Borders this afternoon on a mission for a non-Twilight related book I needed (ps Borders, who doesn’t stock CS Lewis?!) 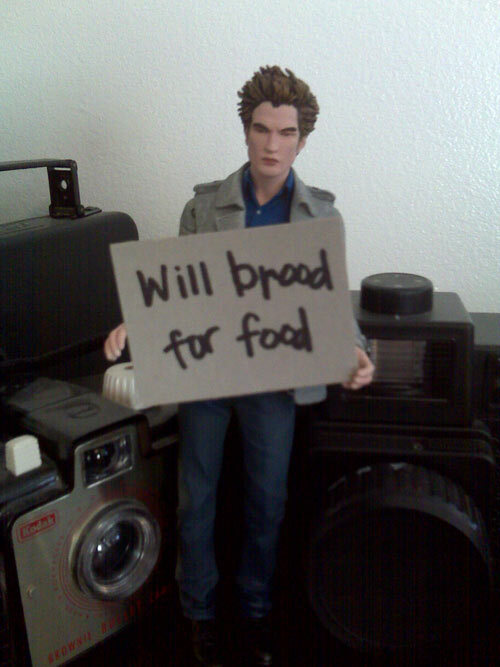 and found out the Edward action figure was on the shelves! So, of course I grab one cause I am both a nerd and in need of some easily portable material for our “Where in the world is the Rob pillow/action figure” category over at Letters to Rob. After I get it home and opened, I start noticing the MAJOR flaws and can totally now tell why these weren’t out for Christmas: they’re a total rush job! First off, the packaging has a misspelling! 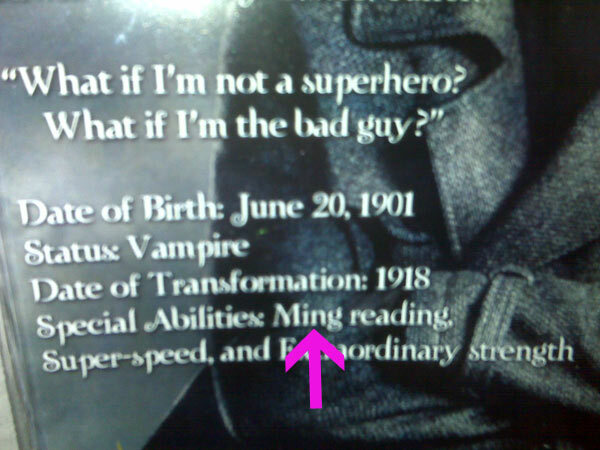 It lists his “special abilities” as “MING reading.” Now wtf is a “Ming?” You mean MIND?? Oh yes… who was on proofreading duty that day? The reason I had to prop him up against some of my cameras is because he is top heavy and unable to STAND UP… this probably also majorly has to do with the fact that ONE LEG IS SHORTER THAN THE OTHER. Really? Did you think we wouldn’t want to take this out of the package and do dumb stuff with it? I could overlook the short leg/standing issue if he was able to sit down. But alas, SURPRISE, he can’t bend at the waist or sit down either! So, you’re stuck with propping him up against stuff. Moving further down, surprise again, his knees don’t bend! It’s like they spent all their time on the upper half getting his hair just right and making his jacket all rubbery feeling and slightly movable (but not fully removable) to worry about actually making the “action figure” work-able. Read my 'MING' Edward, read it! This leads me to the most worthless part of the doll: the Cullen Family crest. We discussed what we thought it’s double usage could be over at LTR but sadly it is NONE of those. It’s a cheap, flimsy piece of rubber which when I tried, his feeble little hand couldn’t even hold onto. So the best usage I could find for it was shoving it under his semi movable jacket. Never know when he’ll need to whip that thing out in some fang-to-fang battle against another crazy vampire. Just think if Irina had had a Denali family crest she could have whipped it out and used it to deflect Caius and not died. Oh well, guess SMeyer never thought about that, but these merch people sure did!! Never mind something that is actually Edward or Twilight oriented. Could Summit Ent. not hire the folks who do the Marvel/DC action figures? Or even the Lord of the Rings or Harry Potter ones? Apparently not, and it shows. Summit should have hired us as their merch idea gals! We could have come up with way better ideas than the perfume or body glitter. All that said, I’ll still have a good time with it and use it in all sorts of inappropriate and funny ways. He’ll just be propped up doing them now. PS has anyone else gotten one yet?